This volume develops a historically informed phenomenology of caste and untouchability. It explores the idea of ‘Brahmin’ and the practice of untouchability by offering a scholarly reading of ancient and medieval texts. By going beyond the notions of purity and pollution, it presents a new framework of understanding relationships between social groups and social categories. An important intervention in the study of caste and untouchability, this book will be an essential read for the scholars and researchers of political studies, political philosophy, cultural studies, Dalit studies, Indology, sociology, social anthropology and Ambedkar studies. Srinivasa Ramanujam, is a Tamil writer and translator. He has translated and published the Collected works of D.R. Nagaraj, as well as plays of Sundar Sarukkai, and essays by Ashis Nandy, M.S.S. Pandian, Seyyed Hossein Nasr, and Gopal Guru. He is the author of Tharkolaigalai Kondaduvom and Sanyasamum Theendamayum. He was formerly a theatre activist and has directed plays of Bertolt Brecht, Kingsley Bass (Jr.), and Siegfried Lenz. 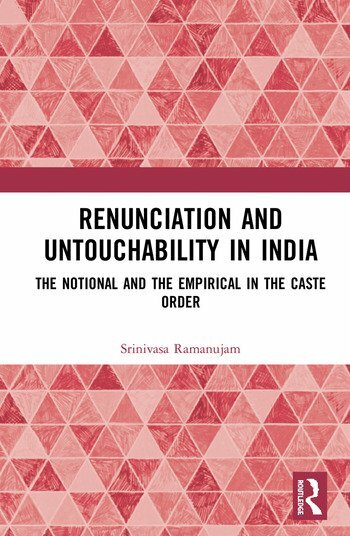 This book offers a fascinating and complex reading of the conceptual and historical genesis of untouchability and the making of the notion of a brahmin. Rooted in philosophical and textual analysis, the book draws on interesting empirical accounts to offer a nuanced and complex understanding of these processes in relation to the larger structure of caste. Originally published in Tamil, this is a fresh and critical voice that will raise new questions in the study of caste in India. Highlighting the similarity between renounced Brahmin body and dead body; pointing out how the negative state of renouncer becomes an ideal state with Adi Samkara who laid the foundation of a new institute, namely, the Mutt; how subject centred nature of touch-un-ability is untranslatable: These are the novel ideas in the book, and these can both shed a better light and complicate the existing discussions on the reform and radical movement in India.